Growing global trade is critically important for providing food when and where it’s needed — but it makes it harder to link the benefits of food and the environmental burden of its production. 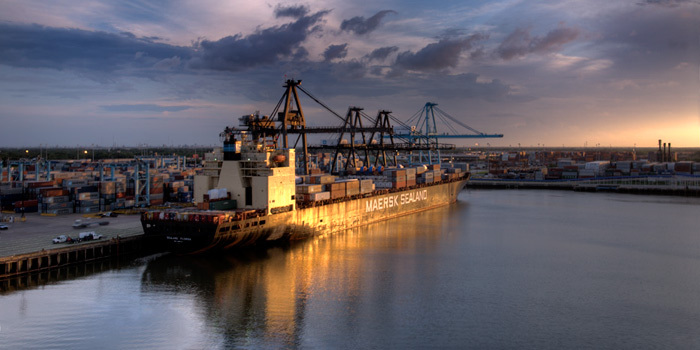 A study published in the journal BioScience by an interdisciplinary team of researchers at IonE proposes to extend the way we characterize global food trade to include nutritional value and resource consumption alongside more conventional measures of trade’s value. 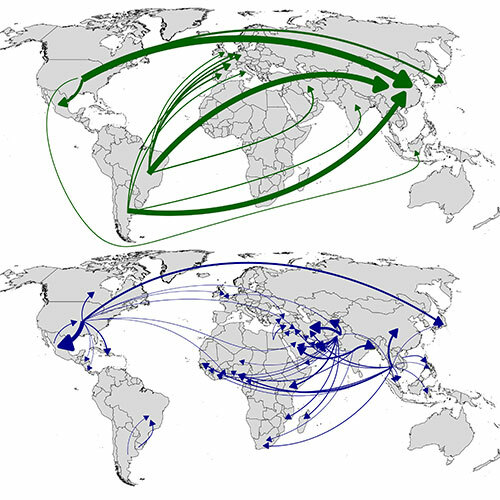 The new study uncovers enlightening patterns in global food trade. For instance, China leads when it comes to relatively land-intensive soybean imports (top map), while the hidden flows of irrigation water underlying rice and other cereal crop exports (bottom map) paints a much more complex picture that reflects the environmental context of production in different regions. Source: BioScience. Global exports of food commodities were worth about US$522 billion per year in the period 2000 to 2009. More than one-fifth of the calories grown in farm fields are ultimately traded, which also required about 20 percent of the world’s croplands (~245 million hectares). Over 70 percent of the global trade according to all metrics is concentrated in only 20 exporting and 33 importing countries. Animal products comprised more than one quarter of the value of trade but only 5 percent of the calories traded. In total, exports of meat and other animal products use at least 8 percent of the global agricultural land base. The bulk of monetary value of food trade is concentrated in trades among European Union countries, but these trade relationships are often facilitated by land use in other regions where the crops behind those products are grown. These ‘re-exports’ from European Union countries require over 9 million hectares of cropland in other regions. Interestingly, whether a country is a net importer or net exporter varied, depending on the metric considered. “For example, China exports apples and other fruits that are fairly high value, while it mostly imports land-intensive but much lower-value soybean. Kenya exports high value tea and coffee, but imports wheat grown on foreign cropland that is an important food staple,” said MacDonald. MacDonald said the findings underscore the importance of choosing the right yardstick when analyzing the global trade network. He said that the study raises new questions about what other metrics could be used to evaluate the broader implications of international supply chains or interdependencies among countries in terms of food and resources.